Diabetes is associated with increased level of blood sugar over extended period of time. This disease is most prevalent metabolic disorder all over the world. Glucose sensor is a device used for testing the concentration of glucose in the blood. This disease has significantly affected huge percentage of population including individuals of all age groups. This has increased the health concerns among the people worldwide and indirectly boosted the growth of blood glucose monitoring devices and sensors. The report gives precise and comprehensive insights on the market trends and dynamics that are shaping this dynamic industry. These includes the major factors driving the growth of the market, factors inhibiting or restraining the market growth and the major challenges faced by the industry. The rise in the diabetes patients owing to the modern lifestyle and obesity across the world is the major factor driving the growth of glucose sensor market. Moreover, the spreading awareness related to the cure of diabetes and steps taken by healthcare professionals, doctors, insurance companies and other health management companies to educate diabetes patients has proliferated the demand for glucose sensors and self-monitoring devices in the healthcare industry. However, the expense associated with the product and unawareness of disease in some countries are the major challenges in the market. The report classifies the global glucose sensor market in different sections – market by diabetes type, market by product type, by technology, by applications, and geography. The glucose sensor market has been analyzed based on the Type 1 and Type 2 diabetes. Moreover, the products in the glucose sensor market has been identified which includes non-invasive, minimally invasive, and invasive. The market for these products categories and the sub-products is estimated and projected form 2015 to 2021 in the report. Besides, the report also tracks the major glucose sensor technologies including Photo Acoustic Spectroscopy, Optical Coherence Tomography, Polarimetry, Fluorescence, MIR Spectroscopy, NIR Spectroscopy, Impedance Spectroscopy, Skin Suction Blister Technique, Sonophoresis, and Reverse Iontophoresis. The major applications where the glucose sensors are used includes hosptials, diagnostics labs, clinics, and home-care. The report is also analyzed based on geographic regions that comprises of Americas, Europe, APAC and others to provide comprehensive analysis about the market. 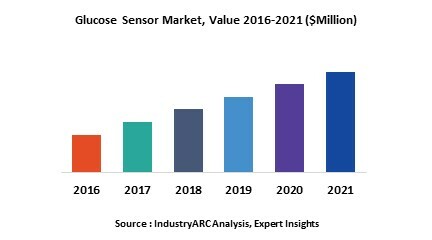 The report also analyzes the different factors in the value chain of the glucose sensor market and also focused on pricing analysis. Unites States accounts for the largest share of diabetes affected population and hence is the highest revenue generating country in the glucose sensors market. Besides, the emerging economies of China, India and other Pacific countries has created huge opportunities for this market owing to expanding economies and rising affluence in these countries. The report gives detailed insights on the competitiveness of the glucose sensor market. The report gives detailed insights on the key business strategies and developments adopted by the key vendors in the market.